This is my mother's recipe and I think she got it from Hershey's from the back of a cocoa can. In a large mixer bowl whisk together the cocoa, flour, sugar, baking powder, baking soda and salt. Add the wet ingredients to the dry ingredients and mix on medium speed for 2 minutes. Fill the baking cups to ¾ full and bake until a toothpick inserted in the center comes out clean, about 22-25 minutes for regular sized cupcakes. Mini cupcakes took 14 minutes for mine. In a mixer bowl beat the butter and shortening together until light and fluffy then add the vanilla. Reduce speed to low and add sugar one cup at a time, when the one cup is incorporated increase speed to medium. Scrape bowl and add another cup of sugar until it's all gone. Slowly add the milk and food colouring if desired and continue to beat until light and fluffy. 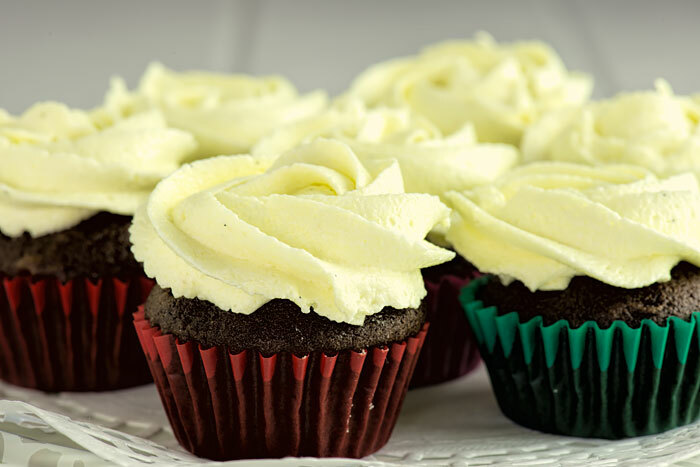 If the icing is too stiff, you can add a tablespoon of light corn syrup, some water or some milk to thin it down a bit.